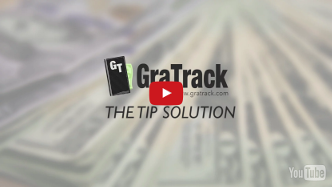 Start by entering the average total sales of your servers and percentage of food sales. Enter bottle wine sales if you tip out a sommelier, Note wine total is not included in total or bev sales. Enter the average guest tip percentage, if you’re not sure what this is for your restaurant add up your total credit card tips and divide by total credit card sales to get an estimate. 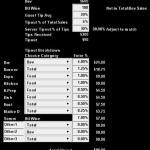 Enter the total tip out as a percentage of total sales, enter both the “Server Tipout % of Tips” and “Tipout % of Total Sales” ensure the percentages for Server Tipout % of Tips match. If you’re unsure of what this is use this information as a guide. when average guest tip is 20% then 5% of total sales roughly equals 25% of tips, 6% roughly equals 30%, 7% roughly equals 35%, etc… Depending on the service level and average shift amount this could vary from 3% – 8% of total sales. Here is a chart of total sales amounts and what we have seen in our client base as correlating percentage of total sales for tip out. 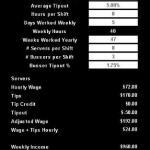 The basic theory behind this chart is that in order for a server to achieve these sales amounts more support is needed such as expediters, food runners, server assistants, maitre d, etc… The sales volume justifies the higher tip out, as you can see per hour tip incomes escalate along with everything else, a server making $39 per hour plus base wage shouldn’t mind tipping out support staff 7% of total sales. Once the shift information is entered configure your Tip out breakdown. 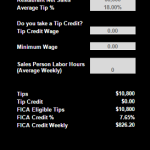 Tip outs can be based on Food, Bev, or Total Sales by using the drop down menus. Adjust your percentages for each support position utilized. Use the variance percentages below to stay within your set tip out maximum. A second lunch calculator is below, if you wish to print this information, use your mouse cursor to select the chart data, In the print dialog box choose the Print Selection option. These spreadsheets are provided “as is”, with no warranty of any kind, expressed or implied, and in no event will GraTrack llc be liable for direct, indirect, incidental, or consequential damages resulting from the use of any of these spreadsheets. The user must assume responsibility as to the correctness and appropriateness of any and all amounts entered and results produced.